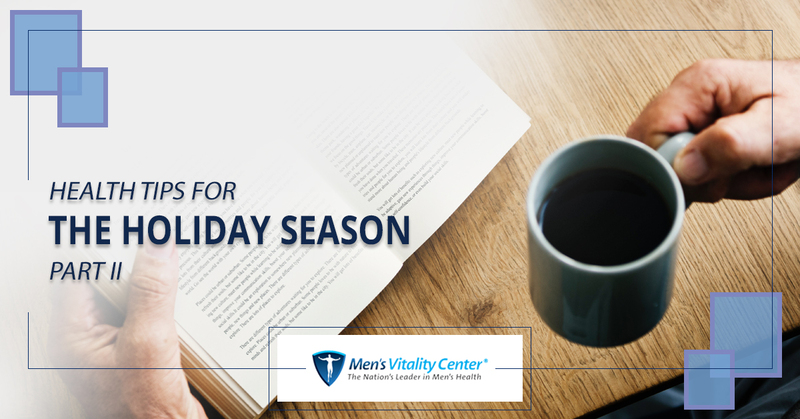 The holidays are almost here, and at Men’s Vitality Center, we want to help you enjoy the gift of health. In a previous post, we provided you with three important tips that can help you stay well this holiday season, so be sure to catch up on that information if you haven’t yet read it. In today’s post, we’ll continue to provide you with information that can help you stay healthy and well during the last few weeks of the year. Men’s Vitality Center in Tempe is here for all of your health and wellness needs. Whether you need testosterone replacement therapy or a general wellness exam, we’re here to help you live your best life. Call 480-588-2430 or fill out our online contact form to schedule an appointment! Low testosterone can cause a variety of unpleasant symptoms, and many of them can be particularly problematic during the holiday season. Some men find that they don’t have the energy to keep up with the demands of the holiday season, while others struggle with the negative emotional effects that low testosterone can cause. Review the symptoms of low testosterone, and get in touch with one of our physicians if you think you may be suffering from the effects of low testosterone. We’ll help you determine if testosterone replacement therapy can help you make the most of the holidays. The holiday season can be incredibly stressful, especially if you’re finishing up high-priority projects at work, planning to leave for vacation, or preparing your home for guests. More and more studies are suggesting a link between high stress levels and chronic health issues (including low testosterone), so make it a priority to give yourself a break during the inevitable hecticness of the holidays. Go for a walk, meditate, journal, or do whatever it takes to relax and unwind. Instead of feeling exhausted and drained when January 1 rolls around, you’ll find yourself energized and ready to take on the new year. It’s almost inevitable that your routine will be interrupted during the holiday season. Maybe you’ve had end-of-the-year meetings that are consuming more of your time than usual, or perhaps you simply don’t have time to go to the gym while your friends and family are in town. It’s perfectly fine to have a few weeks in which your routine is interrupted, but just make sure that you return to your old habits when things return to normal in January. While restarting a diet and exercise routine in January is undoubtedly cliché, it’s better than never returning to your healthy habits! We wrote a guide that can help you stick to your diet back in April, 2018, so read through parts one and two if you’re interested in learning more. We hope that this series will help you stay well and allow you to focus on the things that really matter this holiday season. If you’re interested in learning more about testosterone replacement therapy, or another of the other men’s health services we offer, just reach out to us by filling out the form below. We look forward to speaking with you soon!